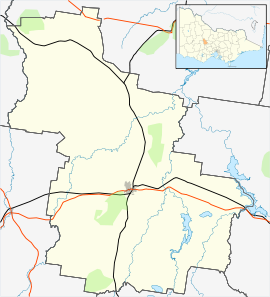 Dunolly is a town in Victoria, Australia, located on the Dunolly - Maryborough Road, in the Shire of Central Goldfields. At the 2006 census, Dunolly had a population of 969. The town began during the Victorian Gold Rush. It is located on the traditional lands of the Dja Dja Wurrung people, who called the area Lea Kuribur. One of the very first accounts of the Dunolly Gold Rush was recorded by the Bendigo Advertiser on 3 July 1857 that estimated the population at 12,000. Confirmation of a rush followed on 10 July. The exact date that Dunolly was founded is unknown. The location of the township itself moved four times before the 1856 rush, further adding to the confusion of its early history. The modern town is the 5th location, and was founded in July 1856 with the previous resettlements driven by further discoveries of gold leads. Technically, even at this time Dunolly was not a town. It was held as a Municipality from 1858 to 1863, and wasn't officially declared a borough until 1 October 1863. Goldborough Post Office opened on 1 March 1856 and was renamed Dunolly in 1859. One of the largest natural gold nuggets ever found, the legendary "Welcome Stranger", was discovered in nearby Moliagul township. Rail came to Dunolly with the opening of the Mildura railway line in 1875. Another branch line that connected to Inglewood in 1888. Centred on the main street, Broadway, Dunolly features a rural transaction centre, SES, CFA, a pre-school and a primary school, and many businesses. Dunolly hosts a monthly market for vendors from all over Victoria and other states. Although Dunolly is located on a major rail line, no passenger services are available, but regular bus services offer travel to and from Dunolly. There is a local museum on Broadway which has a large collection of historic photographs, goldfields implements, replicas of gold nuggets, ladies fashions, needlework, and guns. It also offers a family research facility and regular history tours. A Vintage Caravan Museum is situated on the corner of Broadway and Thompson Street. Dunolly has become a favorite location for gold fossicking using metal detectors. In 2016–2017, gold nuggets of 4 kg (8.8 lb) and 4.3 kg (9.5 lb) were found near Dunolly. The nuggets have been valued at around $300,000. The town's Australian Rules football team, the Dunolly Eagles, competes in the Maryborough Castlemaine District Football League. Star recruits, Shannon Motlop and Robbie Ahmat, have played on the team. ^ Australian Bureau of Statistics (25 October 2007). "Dunolly (State Suburb)". 2006 Census QuickStats. Retrieved 2007-10-01. ^ "A great rush". Bendigo Advertiser (Victoria, Australia). 3 July 1856. p. 2. Retrieved 4 October 2017. ^ Flett, James (1956). Dunolly, the Story of an Old Gold-diggings Town. Poppet Head Press. ^ "Dunolly Municipality 1858–1863". members.westnet.com.au. Archived from the original on 12 Jan 2014. Retrieved 4 October 2017. ^ "Moliagul - Victoria - Australia - Travel - theage.com.au". www.theage.com.au. Retrieved 2017-10-05. ^ "Rural Transaction Centres". infrastructure.gov.au. Retrieved 4 October 2017. ^ "Nostalgic pull of the caravans". www.WeeklyTimesNow.com.au. Retrieved 4 October 2017. ^ Langmaid, Aaron (30 May 2017). "Veteran prospector Syd Pearson tells of the moment he found a 4.3kg gold nugget". The West Australian. Retrieved 5 October 2017. ^ "Gold nugget weighing 4kg found in Victoria". ABC News. 25 August 2016. Retrieved 5 October 2017. Wikimedia Commons has media related to Dunolly. Wikivoyage has a travel guide for Dunolly. This page was last edited on 12 April 2019, at 12:22 (UTC).